Project World School | Mind the Jungle! 26 Apr Mind the Jungle! When writing an article about the neural circuitry of the teen brain in relation to its capacity to learn, an analogy that springs to mind is that of the deep dark jungle: chaotic, dense and ripe with creativity and ideas. It is full of life: new shoots, flowers, and wildlife. There is life and death, there can be rebellion and fighting over territory, and there is the growth of a radical new species, that, if allowed expression, have an overall effect of increasing the abundance and fruitfulness of their environment. Similarly, the teen pre-frontal cortex is going through a tremendous and energy demanding upheaval: neural pathways are going through almost continual life and death (called synaptic pruning), where old ideas that no longer serve are severed and new ideas form that may or may not align with their familial environment. Such neurological innovation in a young person’s brain can be wild and chaotic. It can be perceived as disorganised and unstable. Teenagers can be described as confused and forgetful. Such words are often used in a derogatory sense, however, just like a chrysalis becoming a butterfly, they are the perfect prerequisites for a brain undergoing a huge process of neurological rewiring. Just like the new life in the jungle, the re-organisation of the young brain from childhood into adulthood is an essential evolutionary adaptation for the progression of humanity. The new adult must be able to learn from the mistakes of the past, and break through dense layers of conditioning to bring forth new knowledge to the world and discover their unique place and purpose. They must be able to make the refinements and improvements necessary to progress mankind – to do so they must learn from and be respectful of the past whilst simultaneously individuating from it. This is an extraordinary task that could be described as divine in its nature. Indeed, it is a phase of life that has been honoured and marked as extremely important in indigenous cultures around the world for the benefits it brings to individuals and the community at large. Sacred rites of passage and initiation for developing adults form an integral part of our collective psyche. And yet, in the West, such celebration and appreciation of this stage of development is sorely lacking. Although Western education has come a long way in the last century, it still holds the codes of the now outdated production-based industrialised society from which it was created. In such a paradigm, time, information and nature must be manipulated and carved into pre-approved, convenient bite-sized sections. Such education has provided the grammarian ability to critique and dominate others intellectually through super-rationality and analysis. It has also made possible colonialism, the production line, and space voyaging. But it has not helped our young people be happy or feel whole, nor offered them easy opportunities for branching into new and nurturing roles as adults. Such a rigid system of learning, with Pavlovian conditioning and testing, is a fantastic way to herd a lot of people into jobs with predefined tasks, however it is not the ideal environment for fostering CURIOSITY – a key driver for the creation of innovative thought. The jungle, like the young brain, has been forced into lines and squares; uniformity, obedience and standardisation. If we have an interest in facilitating jungle diversity through protecting wildlife, and preventing the exploitation of natural resources, then we must extend the same courtesy to our own children. For education to be aligned with the teen brain, we must know how the young mind works: new neural pathways are self-directed foraging instruments. They have no regard for authoritarian discipline. In the quest for clarity, whole neuronal maps will be torn apart; old concepts, files and categories re-ordered, mixed up, and recategorized into a new form. Such is the chaos of creativity and the formation of new ideas. If such innovation is not listened to, or worse, scolded for grammatical errors or poor handwriting, then a young person can be left feeling like there is something wrong with them for not being able to sit within the confines of a rigid system of learning. Just like a new shoot in the jungle, the new neural pathways of the pre-frontal cortex need space and an almost inexhaustible amount of time to grow and develop. This time and opportunity for natural exploration is precisely what is not afforded to young people. Instead, they are pressured to get the grades, jump through the hoops and perform for others. This discord between purpose and performance can create a conflict between the young person’s inner integrity and the external demands to behave in a certain way for approval. Such demands can interfere and damage new potential and create a fear of learning rather than a life-long, joyful curiosity. Keep in mind motivation is important and motivational memes for work help you to motivate in some way. Interestingly, with the technological revolution, the current pedagogy of education in the West is also creating workers for jobs that no longer exist. For education to truly evolve, it must meet the demands of a new society, where entrepreneurial skills, networking and collaboration are more necessary than the ability to compete and conquer. If Western society can revive and integrate archaic principles and ways of life, then it can utilise its industrial and technological innovations for the benefit of connection and networking. Here at Project World School, we see an integration of technological advancement with age-old indigenous wisdom. Industry and technology have been necessary for development. However, as with any phase or epoch of learning, we must continually circle back to our roots and revise our methods. Young people do not need to be tamed or moulded into a set of pre-defined conditions. Nor do they need their environment infinitely split, carved and sliced into discrete concepts and categories. Young people do not need to be fuelled by the anxiety of an “if-then” mentality. Indeed, the prefrontal cortex simply cannot do this. In a time of global environmental and economic difficulty, it is the young people that need to be empowered to action their ideas. To do this, Western teenagers need to share themselves and learn teambuilding activities with like-minded peers. They need to branch out and learn from other cultures and societies. Teenagers need to immerse themselves in nature, for the seeming chaos and irregularity of nature mirrors the learning environment of their internal world. Just like the jungle, they need the sky above and the ground below to give air to their intensity and ground to grow from their roots. They need a set of dedicated elders who, like the oldest trees of the jungle, support them, provide shade, and are relaxed enough in their own development to patiently practice watchful waiting in communities that provide safe and enjoyable immersive learning. Many schools and government initiatives are planting the seeds for educational changes. There is a plethora of opportunities being provided for young people from all backgrounds to experience these co-creative learning environments. 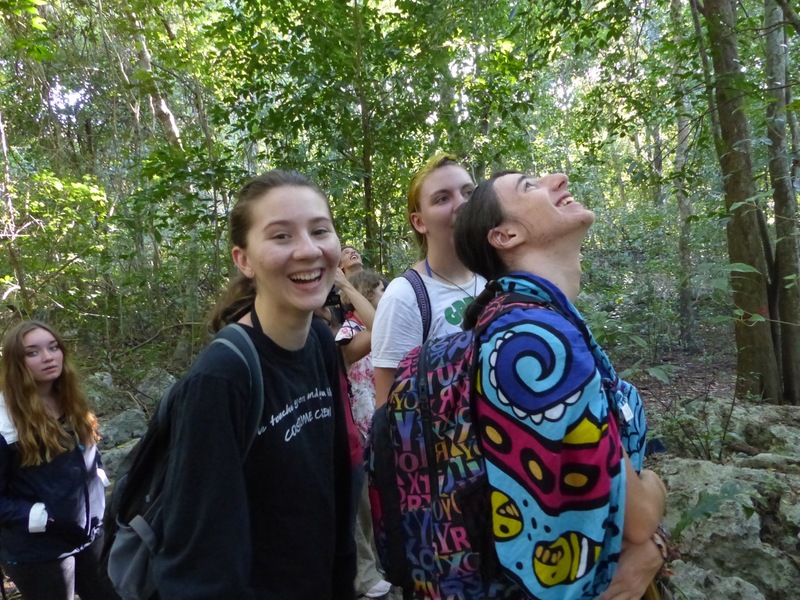 Project World School works with all young people whether in mainstream schooling or not, to provide the answer to the deep call that we all have at times in our life for adventure and rich exploration further afield. The Amazon jungle is said to be the lungs of the planet; once the seeds of a true love of learning unfold from a young person, they too, can give life to the world.